The original Scream Queen, Vina Fay Wray was born in September 1907 in Alberta, Canada. Relocating to Los Angeles as a child, Wray was educated at Hollywood High before landing a bit role in the 1923 comedy Gasoline Love. But it was really Erich von Stroheim's The Wedding March in 1928 that gave Wray her first starring role and brought her substantial public notice. After a string of films made for Paramount (including 1928's Legion of the Condemned and 1930's The Texan both co-starring Gary Cooper), Wray made her first horror pic with 1932's Doctor X. Directed by Michael Curtiz, Doctor X tells the story of a series of strange murders plaguing New York City...supposedly committed by a maniacal 'Moon Killer.' The dastardly killings are traced to a medical school run by Dr. Xavier (Lionel Atwill) and his daughter Joan (Wray). But who is the true moon psycho? Also in 1932, Wray found herself desperate prey in The Most Dangerous Game, an adventure thriller about a big game hunter who stalks a group of shipwrecked passengers on a deserted island. In 1933, Wray co-starred along with Lionel Atwill, Melvyn Douglas and Dwight Frye in The Vampire Bat, a charming '30s horror about a mad scientist who murders in order to procure human blood for his 'experimental' pet projects. That same year, Wray aroused a deadly interest from Atwill in Mystery of the Wax Museum (1933), again directed by Michael Curtiz. In Wax Museum, sculptor Ivan Igor is left for dead in a fiery blaze that destroys his precious wax exhibits. He resurfaces years later and opens a new exhibit of lifelike wax figures...as dead bodies begin disappearing from the local morgue. But it was her work alongside a prodigious gorilla in Merian C. Cooper's classic King Kong (1933) that immortalized Wray as the undisputed First Siren of Horror - and cemented her career one way or another. As down-and-out actress Ann Darrow, a lung-empowered Wray played beauty to Kong's beast and helped imbue the film with just the right amount of heart needed to complement Willis O'Brien's marvelous special effects. Of Kong, Wray commented: "I used to resent King Kong. But now I don't fight it anymore. I realize that it is a classic, and I'm pleased to be associated with it." In 1935, she appeared in the thriller The Clairvoyant (aka The Evil Mind). In it, fraudulent psychic Maximus (Claude Rains) and his wife Rene (Wray) enjoy some limited success in the music-hall scene. But then Maximus begins to experience real premonitions...and their lives start to unravel. She continued to work steadily until her semi retirement in 1942. In the 1950s, she enjoyed a comeback of sorts, appearing in a number of films including Treasure of the Golden Condor (1953) along with Cornel Wilde and in Queen Bee (1955) starring Joan Crawford. Ms. Wray lived quietly in Manhattan for the majority of her life before passing away in August 2004. 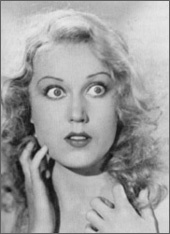 A commemorative plaque in the lobby of the Empire State Building holds testament to Fay Wray's skyhigh significance. The inscription reads: "The Giant Ape Climbed Here. And She Was Why."